And there, buy cameras by the score. best, or ragged day dress. Is snuffed, easily as candlelight. Eating candy with the wrapper on. Take photos, before the young perish to the very last. So the image of the dear face will forever live on. Or be solace in your old age. Take photos, take photos, before all the children are gone. The feet and inches, from the ground, sprouting. Men who escaped the meaning of the passage of the years. But escaped the meaning so Social Responsibility. Are long dead; forget morality! Doomed, despicable, craven images of humanity. Please, hurry! Take photographs of all the children, now! Take photos, for tomorrow they will be gone. Children who will not see thirty. Children who will never …grow…old. What did I have to complain about? He worshipped the ground I walked on! Definitely, were no longer children! Did this mean I was old? How could it be – when had that happened? I was just discovering my essence! I knew all there was to know about life. Nurtured it to healthy maturity. I am grateful for the love that was mine. I suffer, but I could not have asked for less. I have lived a good life. Look. Just look! How they truly no longer need me! For time is short, each hour more precious, therefore! Mine has been a long life – rich in experience. Time enough to catch up! Pass me that damn bottle of wine, will you? Mama Magona is an admiring trailblazing force! Her poetry is spiritual..igniting love to the human soul! A native of the Transkei, she grew up in a township near Cape Town, where she worked as a domestic and completed her secondary education by correspondence. Magona later graduated from the University of South Africa and earned a graduate degree from Columbia University. 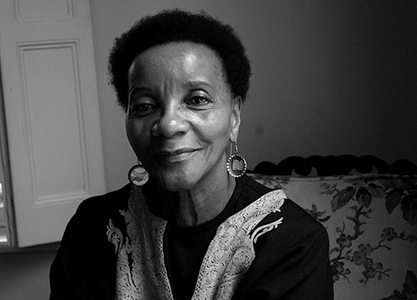 She retired from the United Nations in 2003 and currently lives in South Africa. She published her autobiography To My Children’s Children in 1990. In 1998, she published Mother to Mother, a fictionalized account of the Amy Biehl killing, which she adapted to a play. This was performed at the Baxter Theatre complex in late 2009 and the film rights to the novel were acquired by Type A Films in 2003. She has also written autobiographies and short story collections. Her novel Beauty’s Gift was shortlisted for the Commonwealth Writers’ Prize Best Book, Africa Region. In 2009, Please, Take Photographs, her first collection of poems, was published.